Balayage is a technique often used in the world of French fashion. The special thing about this technique is that it uses no foils whatsoever! The goal of this process is to refine your hair colour, whether natural or not, without damaging it. Balayage should not really be viewed as colouring or highlighting, but rather as a way to accessorize your hair: adding more lightness and radiance to your existing colour. Because balayage is always tailored to the individual, the result obtained is unique, with a very natural finish. 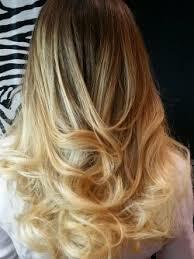 Californian balayage : avoids visible roots, with the balayage widening towards the ends of the hair. For layered hair. Starting from £130 ( only £100 for Hair Salon Members). Sunshine balayage : focussed on the ends of the lengths to create that ‘I’ve just come back from holiday’ look. Starting from £95 ( only £60 for Hair Salon Members ). The tie dye and dip dye : darker at the roots and getting lighter towards the ends. Starting from £130 ( only £100 for Hair Salon Members ). Chez Stephan offers a comprehensive Balayage service, and if you are a Chez Stephan member you will receive a deep conditioning treatment and blow-dry at no extra cost.